Not long ago Oliver Percovich and Sharna Nolan arrive in Kabul with little more than a couple of skateboards. in a country where children constitute more than half the population, they soon discover that their boards draw local children like a magnetic force. After beginning regular skateboarding sessions in an abandoned fountain, one of the few smooth surfaces in Kabul, local boys and girls from the streets start to join them on a daily basis. These initial encounters, informal at first, eventually lead to the foundation of Skateistan, Afghanistan’s first co-educational skateboarding school. 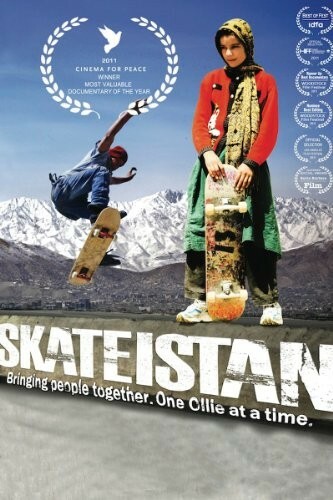 The film tells Skateistan’s story and how how a group of amateur- and pro skaters bridge ethnic, religious and socio-economic barriers to bring hope to the children of a war-torn country – with the help of four wheels and a board. Please note: this is the streamed rental version, not a DVD purchase.